Join us for an evening at one of the crown jewels of Boston! YOU help choose the music in the exciting, interactive concert experience! The Boston Pops draws on its incredible library of music, and even more incredibly virtuosic musicians, to play selections that the audience chooses from their web-enabled devices, live at the concert! 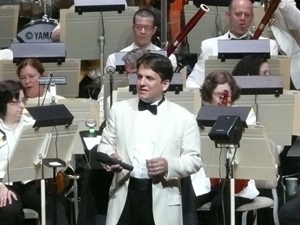 For part of the concert, you’ll get to pick your favorites among classical, film music, Broadway, and rock—the great breadth of music the orchestra has played during 20 years with Keith Lockhart at the helm. Be sure to bring your smartphone or tablet to join the fun! We'll have drinks or perhaps light dinner across the street at the Ginger Exchange around 6:30pm. We have a group of seats together in the first balcony. Attire: Gentlemen: collared shirt, no jeans or sneakers. Blazer optional. Click here for more information. Parking: Limited on-street parking. Click here for more information. For more information, contact Ray Chang at rchang@mitsloanboston.com or 781-879-4117.